Fig Leaf Rag, among many rags Scott Joplin published in 1908, came from the period of time when he was trying to secure funding for production of an opera in New York City. Although the premier composer of the genre for his day, Joplin truly wanted to make his mark in a more “serious” form of music, such as operatic productions for the stage. He in fact composed several operas over his career and repeatedly tried to make a success of them—but his efforts bore little, if any, fruit in that area. He was far more successful, in the long run, as a ragtime composer and pianist. 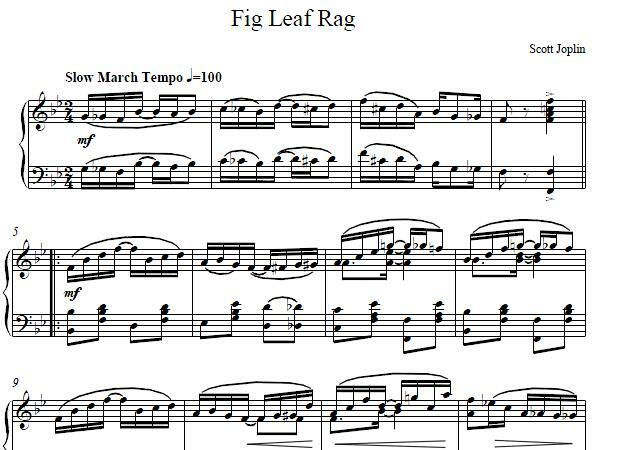 Although maybe not considered a “classical” piece in its time, Fig Leaf Rag in fact shows strong classical influences in its style and form. Along with Maple Leaf Rag and Gladiolus Rag, it indicated that the composer was both grounded in traditional common-practice chord structures and willing to “stretch” them with the use of chromatics. It is believed that Scott Joplin was not as firmly grounded in musical notation, which is why he often had collaborators and/or his publishers “edit” his music and clean it up, often to the extent that they were listed as co-composers of the pieces as well. The spirit of this rag is lighthearted—as is the cover of the original published version of Fig Leaf Rag. It features what was probably a risqué cover for its time, showing a female figure covered by a large fig leaf, with the composer’s picture in the middle! The publisher, John Stark, wasn’t known for sensational or provocative covers; it’s not known whether he approved of this artwork prior to publication, as the actual production plant was in St. Louis while he was in New York, and his children may have been more responsible for how this work went out than he was. Nevertheless, while the cover may have been a bit “out there,” Fig Leaf Rag’s music was and is solid. It’s melodic, engaging, and challenging all-around. We hope you enjoy the challenge of playing this lively rag!